Despite this year's nuclear reactor meltdowns in Japan, its neighbor South Korea is moving ahead with an expansion of its civilian nuclear industry. Not only is South Korea building more atomic power plants on its own, it is also increasing exports of its indigenous technology. The disastrous setbacks to Japan’s nuclear industry and moves by other nations, such as Germany, to shutter all nuclear power plants have not dissuaded South Korea from expanding its atomic energy capabilities. The country currently relies on domestic nuclear plants for about one-third of its total electrical output. It hopes to increase that to 59 percent in less than 20 years. Younggwang Nuclear Power Plant, Uljin-gun, Gyeong-buk, South Korea, (undated photo). Meanwhile, after recent deals with such countries as Jordan, Saudi Arabia, the United Arab Emirates and Vietnam -- cumulatively worth tens of billions of dollars -- South Korea could become a major exporter of nuclear energy technology and expertise. 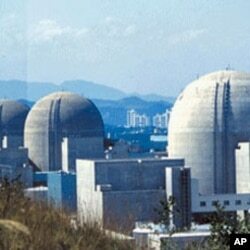 It is looking at striking deals for additional nuclear plants in China, Romania and Turkey. After the meltdown of three reactors in March at Japan's Fukushima-1 nuclear plant, following a huge earthquake and tsunami, South Korea carried out a quick safety review of all of its reactors. Nineteen are online, two are offline for maintenance and seven more are under construction or planned. The country's oldest nuclear power facility, built in 1978 was under special scrutiny earlier this year. The Gori-1 reactor, near the port city of Busan, was off line for two months after a fire in April destroyed one of the circuit breakers. Gori-1, with an output of 578 megawatts, had originally been set to end operations in 2008, but was given an extended lease on life. South Korea's Minister of Education, Science and Technology, Lee Ju-ho, says the public should be assured Gori-1, despite its age and previous problems, is not a hazard. Lee says safety experts concluded after this year's incident it was still safe to operate the plant so the ministry decided to follow their advice and re-start the reactor. South Korea says, in wake of the Japan disaster, it is enhancing safety measures at the existing nuclear plants in the unlikely event there could be a radiation leak resulting from a natural disaster, such as an earthquake or a tsunami. The one billion dollars worth of upgrades will be done over the next five years. Both South Korea and Japan are poor in natural resources and have mainly relied on imports of fossil fuels to power their economic development in the past decades.